Opened in 2013, Gilded Age Vermont reflects the industrial boom in Bennington from the mid-nineteenth century through the mid-twentieth century. Bennington was a leading industrial town in New England from the mid-nineteenth century through the mid-twentieth century — at its height, around 1890, it was home to nearly three dozen individual mills along a two mile stretch of the Walloomsac River — manufacturing everything from woolen underwear and pottery to stereographs and automobiles. With this industrial boom came economic prosperity as well. The mill owners built glorious homes, often a stone’s throw from their factories, and filled them with beautiful art, furniture and decorative objects. Workers in the factories, especially skilled laborers, also had the luxury of expendable income and were able to afford some of the finer things in life. Further wealth poured into town during this era in the form of summer residents, many from the Troy and Albany, New York, area, who built new summer “cottages” or refurbished existing, often historically significant, homes. 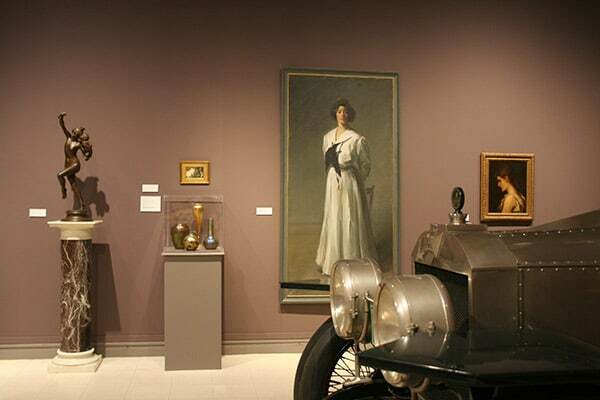 This gallery highlights the industrial and cultural innovation of our region’s “Gilded Age” — a phrase coined by Mark Twain in 1873 — through objects that were either made or owned in Bennington and the surrounding region or created by artists with connections to the area. From the elaborate Renaissance Revival furnishings that adorned mill owner Henry Bradford’s home on Bennington’s Main Street and a stylish parlor organ manufactured by the Estey Organ Company of Brattleboro, Vermont, to Frederick MacMonnies’ sumptuous portrait of May Suydam Palmer, a summer resident of Bennington, and the Martin Wasp, a luxury automobile made in Bennington by Karl Martin between 1920 and 1924, the objects in this gallery paint a picture of innovation and prosperity from Vermont’s past.